The future of Flint and Genesee County depends greatly on the investments made yesterday, today and tomorrow. And based on the returns thus far, the outlook for a thriving 21st century urban center in the next few years is very promising. That’s because the Flint area is “comprised of forward thinkers and doers,” said Chamber CEO Tim Herman, to more than 400 guests in attendance today at the Holiday Inn Gateway Centre. The Chamber’s 2017 Annual Meeting also featured a panel discussion that addressed three areas – Flint & Genesee County Today; Models to Follow; and Flint & Genesee Tomorrow. The panelists were: Dr. Beverly Walker-Griffea, President, Mott Community College; Bob Waun, CEO, C3 Ventures Flint, LLC; Eric Larson, CEO, Downtown Detroit Partnership; and Will McClure, Jr., a student at Michigan State University College of Human Medicine. In addition, Steve Landaal, President of Landaal Packaging, was elected Chair of the Flint & Genesee Chamber’s Operating Board of Directors for a one-year term. He replaced Past Chair Robert Rummel, Senior Vice President at Chase. Overall total wage growth increased 24.8 percent from 2010-2015. Genesee County unemployment rate was down to 5 percent in December 2016 from 5.8 percent the previous year. Home prices rose 3.26 percent in 2016 over 2015. Landaal said the Chamber and region made significant strides in 2016. “But not only is it important to look in our rearview mirror regularly, it’s equally, if not more important to look ahead,” said Landaal. 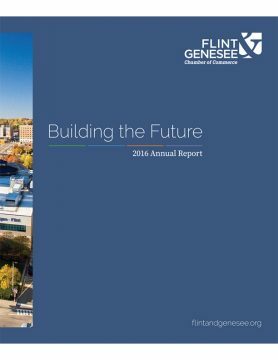 A copy of the Chamber’s Annual Report is available online at flintandgenesee.org.